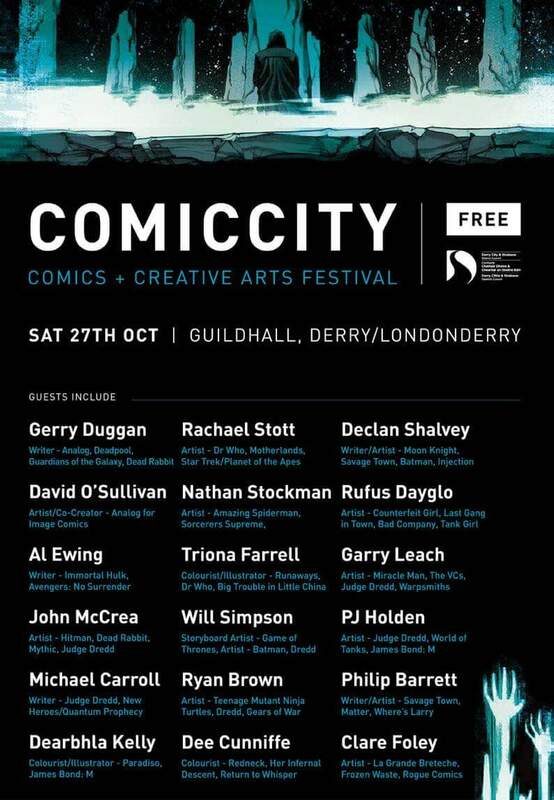 Rogue Comics Ireland are delighted to announce that we will be partnering with Revolve Comics, The ComicCityCast, The Irish Pubcast, Angry Cherry, the Derry City and Strabane District Council and finally the Halloween Derry Festival to produce this years ComicCityFestival in Derry on Saturday the 27th of October. This promises to be the best free pure comics event in 2018. We'll be bringing you more news over the coming weeks about which creators from our Rogues Gallery will be attending and what surprises they have in store for the good comic-loving people of Derry. Huge thanks to Declan Shalvey for allowing the use of his wonderful Injection artwork to promote the festival. For more information and regular updates please follow ComicCity on Social Media.